With the kids heading back to school, it’s likely that parents and Booster Clubs are starting to think about all of the activities the school year brings: pre-game meals, dances, club meetings, sports events, and end-of-season banquets – we can even take care of school lunches! Many of these functions require food and drink for those in attendance (both students and chaperones), and in many cases, the school system will find outside caterers to take care of these functions. 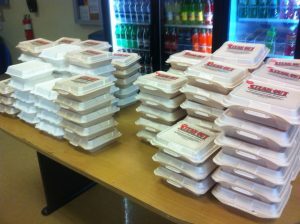 Steak-Out Charbroiled Delivery is happy to provide our local schools with expert catering! Our owners understand the needs of many school systems, and we provide the highest quality food and drinks to your students, parents and visitors. If you have upcoming school functions, let us be your go-to catering team – you won’t be disappointed! We can serve any size group effectively, timely and economically. We’re the perfect alternative to pizza, sub sandwiches and barbecue. All of our steaks, chickens and burgers are basted in our secret sauce and seared on our open grill. You don’t even have to worry about silverware, napkins and condiments – it’s all included with the order! We can even separate orders by name for easy distribution at the time of delivery. Contact your local Steak-Out Charbroiled Delivery to schedule your school function catering. Our team is standing by to help you choose the best options to make your function over-the-top and one for the yearbook!